Fissler Pressure Cookers - Don't Buy Until You Read This! 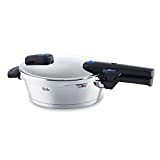 Fissler pressure cookers can be expensive, but if you want to invest in the best stainless steel pressure cooker for your kitchen, you can’t go wrong with the Fissler Vitaquick Pressure Cooker Line. For that money you get top quality and – as testing proves – “best in class” cooking performance. For those of you just looking for the best deals, I’ll start with some hot listings I found on Amazon — great discounts I couldn’t match at other online retailers. 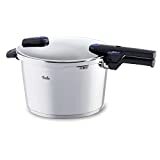 Scroll down for my full report on what makes Fissler Pressure Cookers the best on the market today. Fissler Pressure Cookers are stainless steel. Why don’t you want aluminum? Aluminum reacts with acidic foods such as tomatoes, giving your food a metallic taste. Aluminum is less durable. Aluminum won’t work with induction cooktops. Aluminum is fine as a disk inside the base to help distribute heat evenly but not as the primary external material of the pot. Maintaining heat and pressure is essential so that you don’t undercook your food. A thicker heating plate helps to maintain high heat and Fissler has the thickest heating plate of the popular pressure cookers meaning they heat evenly and hold the heat once they are cooking. 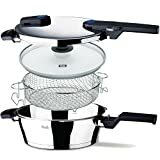 Fissler pressure cookers heat quickly, evenly and stay hot better than other pressure cookers. 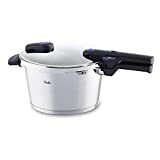 One thing you’ll notice from the test kitchen video is that the Fissler Vitaquick Pressure Cooker was the ONLY one in the test to achieve the desired/claimed pressure of 15 psi and 250 degrees Fahrenheit. Less temperature and pressure means that the food might not be cooked properly if you follow the recipe. You might have to heat it up again and continue cooking which defeats the whole purpose! The Pressure indicator is easy to see from across the kitchen so you don’t have to hover over it as it’s heating up. When you pressure-cook, you heat it up and then turn it down to low for the balance of the cooking so this is an important feature. Poor seals can mean a loss of moisture and pressure which will mean undercooked food. The Fissler Pressure cookers have fantastic seals and are solidly constructed and perform exceptionally in pressure tests. As I’ve already pointed out, the design of the Fissler Pressure Cookers – low and wide – makes it easy to brown meats and the pressure indicator design is easy to read from across the kitchen. It also has a convenient automatic lock and is one of the few pressure cookers that is completely dishwasher safe — even the handle! The best pressure cookers are stove top models, not stand alone electrics. The stand alones cannot attain the high temperatures and pressures expected for pressure cooking. They usually have non-stick interiors that get damaged quickly, are difficult to clean properly, and are difficult to empty into the sink. If you want to pressure cook, you really REALLY need a stove-top model and not an electric. 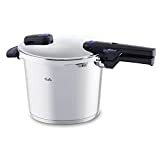 You can find decent pressure cookers like the Fagor brand for less, but the quality is not really on par with Fissler and quality is very important when it comes to pressure cooking. 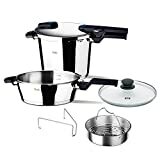 We would also choose Fissler over the Kuhn Rikon pressure cookers — another premium brand which doesn’t perform as well simply because they are not designed as well as the Fissler cookware. The bottom line is, if you want to pressure cook (it’s trending in popularity for good reason!) you don’t want to get one that won’t work properly in the times specified in your recipes. You don’t get to poke your food with a thermometer until you’ve let out the pressure — and if it’s undercooked, you have to heat it up again. That’s the performance argument that Fissler Vitaquick Pressure Cookers Win every time. That, and they are beautiful, high-quality German cookware. Check out the deals we found at the links AFTER THE FISSLER PRESSURE COOKER VIDEO below… and Happy Pressure Cooking!